Hilary is four, not yet five, and she has a mother and a father and an older brother and sisters. She even has a name at home – Billy – that is different from her written-down name. But now that she is in Low Babies in the local convent school, it seems Hilary has something else called responsibilities. The world is a changing place. Hilary’s parents, themselves products of a country bathed in sanctifying grace, and presided over by leather-strapped Christian Brothers, wimpled nuns, and a strictly ingrained moral code, start to question their own life choices. As she begins to mature, Hilary’s perspective shifts from a confusing mosaic of half-understood conversations, bizarre rules and surreal religious symbolism, to a growing awareness of the eccentricities of the adult world around her, where money is tight, ideas are unorthodox and where living life to the full is the goal. As her parents’ unconventional lifestyle rubs against the grain of a pervasive Catholic society, the cracks begin to appear: siblings are expelled from school; final demands litter the hallway; and Hilary discovers the truth about the always-present but never-to-be-mentioned golden-haired lady. 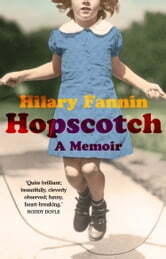 Hopscotch is a funny, poignant and beautifully written memoir, a spellbinding meditation on innocence, love and memory itself.